2010 September 09 » Embroidery Talk Has Moved! Yesterday I wrote a post about avoiding boredom in life and in machine embroidery and a scant few hours later I got notification that a series of pictures were waiting to be downloaded. The pictures were of the falcon jacket that Erich Campbell from Black Duck Inc had created for a Stitches photo shoot. Unfortunately, the jacket was not used in the final spread in the magazine, but Erich is graciously allowing me to share with you the pictures of his work here. 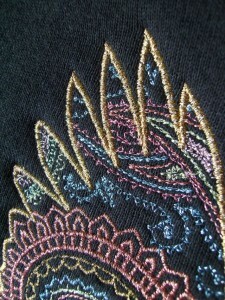 I’m very excited because the design was sewn with EnMart’s colored metallic thread and I think it’s just awesome. 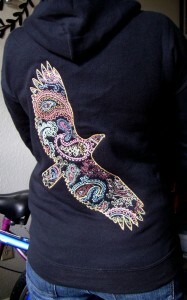 Let’s start with a full back picture, because I think the full effect of the embroidery is pretty cool. 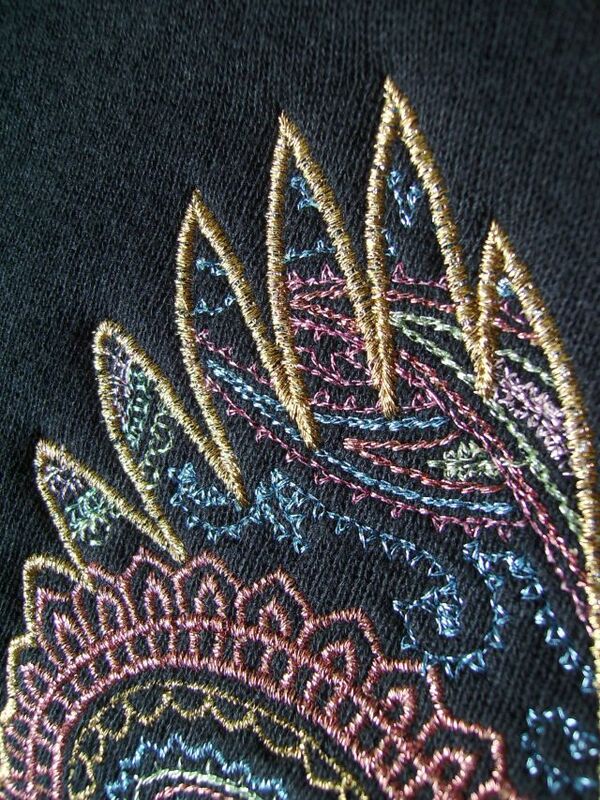 As far as I know, all the metallic thread used in this piece was from EnMart. When Erich first told me about this project, I offered to send him some of our colored metallic threads to try if he would share pictures of the finished product with us. I wasn’t expecting anything as elaborate as this. 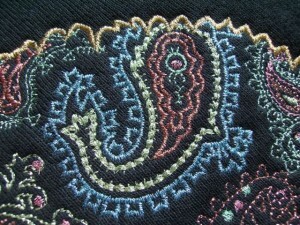 When you look up close at the design, you really get a sense of the intricacy of what Erich has done. I can’t imagine the digitizing and work that went into this. Plus, sewing something this elaborate with an average metallic thread would give most people heartburn if not actual heart failure. 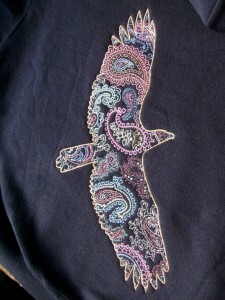 Erich also managed to incorporate one of my favorite colored metallic threads into the design. 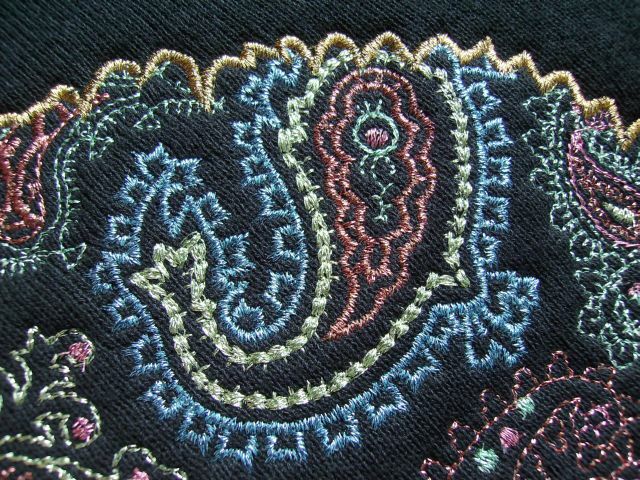 I’m a huge fan of the turquoise metallic, and Erich used that quite extensively for one of the paisley designs. I’m quite overwhelmed by what has been created here and it pleases me no end that EnMart products were part of it. I think everyone who works in the garment decoration business knows that creativity and originality are part of what we do, but sometimes you need to see something really special to be reminded. Thank you to Erich for sharing his design with us and for all the time and effort that went into creating it. Thank you also to his wife, Celeste Schwartz, who took the photos that were used in this post. You can see more of her work here.